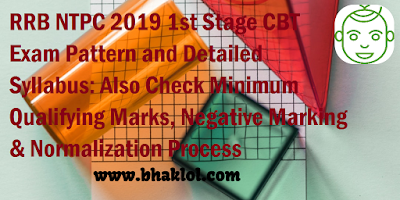 Dear Students, We are sharing RRB NTPC 2019 Exam Pattern and Detailed Syllabus of 1st Stage Computer Based Test (CBT) which is Common for all notified posts of this CEN 01/2019. Also sharing Minimum percentage of marks for eligibility in various categories. The section wise distribution given in the above table is only indicative and there may be some variations in the actual question papers. There will be negative marking and 1/3 mark shall be deducted for each wrong answer. The 1st Stage CBT is of screening nature and the standard of questions for the CBT will be generally in conformity with the educational standards prescribed for the posts. The normalized score of 1st Stage CBT shall be used for short listing of candidates for 2nd Stage CBT as per their merit. Candidates who are shortlisted for 2nd Stage CBT availing the reservation benefits of OBC(NCL)/SC/ST/EWS, PwBD and ExSM shall continue to be considered only against OBC(NCL)/SC/ST/EWS, PwBD and ExSM for all subsequent stages of recruitment process. 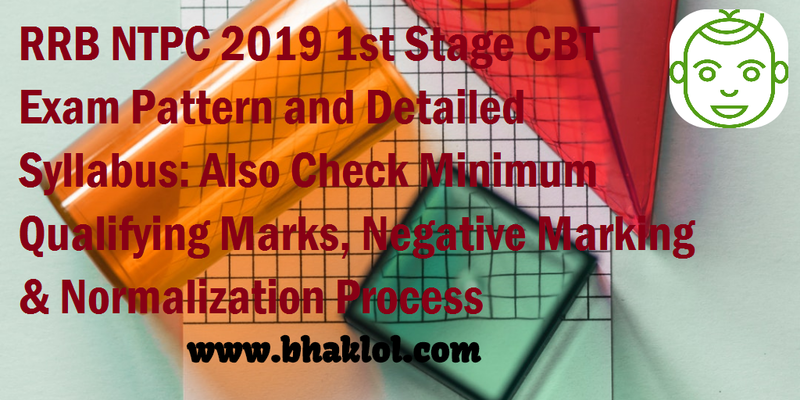 Short listing of Candidates for various stages shall be based on the normalized marks obtained by them whenever CBT is conducted in multiple sessions for the same syllabus. The normalization scheme to be adopted for 1st Stage CBT and 2nd Stage CBT is detailed in following paragraphs. Minimum percentage of marks for eligibility in various categories(RRB NTPC 2019): UR-40%, EWS40%, OBC (Non creamy layer) -30%, SC-30%, ST-25%. These percentages of marks for eligibility may be relaxed by 2% for PwBD candidates in case of shortage of PwBD candidates against vacancies reserved for them.